Honestly, I wasn't quite sure that I was going to be able to even get a post up today, one of the reasons being that I was feeling totally uninspired, but the main reason being that I'm feeling so sick. It's been me and my bed and my tissues for the whole day so far. However, as I was sitting in my bed feeling miserable, I was thinking, what can I do to make this day better? You might have read my post on little things that you can do to make someone smile, but this is a slight variation on that post, about how you can make yourself happier. I'm a huge believer in self-love and self-care, so I find it so important that you do things for yourself. This obviously only works if candles are your thing, but it works for me. Make your sense of smell happy! A lot of the time, the things that make for a good day are not big things, but a combination of a lot of little things. That's not saying that one big thing can have a huge positive effect on your day, but it's important to keep in mind that the little things can still have a great effect on a brighter day. Pick a candle that reflects how you think that you want to feel. Today, I lit a candle with a fresh and fruity scent, because I want to feel more refreshed and rejuvenated. While the immediate response when you're in need of a better day would be to go for the fatty comfort foods, it's a different kind of happy that you get when you eat something healthy. Preferably eat something healthy that you like anyways, like your favorite fruit, a fresh salad, or my personal favorite, a smoothie, but whenever I eat something healthy, I feel really good about myself after. It's the feeling after, kind of like a pat on the back for being healthy, that really makes me happy. Comfort foods can obviously make you feel happy in a different way, after all, they're not called "comfort foods" for nothing, right? If your day isn't looking too hot, then who am I to stand in the way of you treating yourself? Suggestions include ice cream, any fancy pastry, or some rich chocolate, but obviously go for whatever speaks to you. Similarly to the "healthy eating" aftertaste, the same logic stands with productivity. I always feel so accomplished and happy with myself when I do something that I had been meaning to get around to doing and maybe had put it off a bit longer than I should have. Being productive can leave you with a great feeling after your complete your tasks. 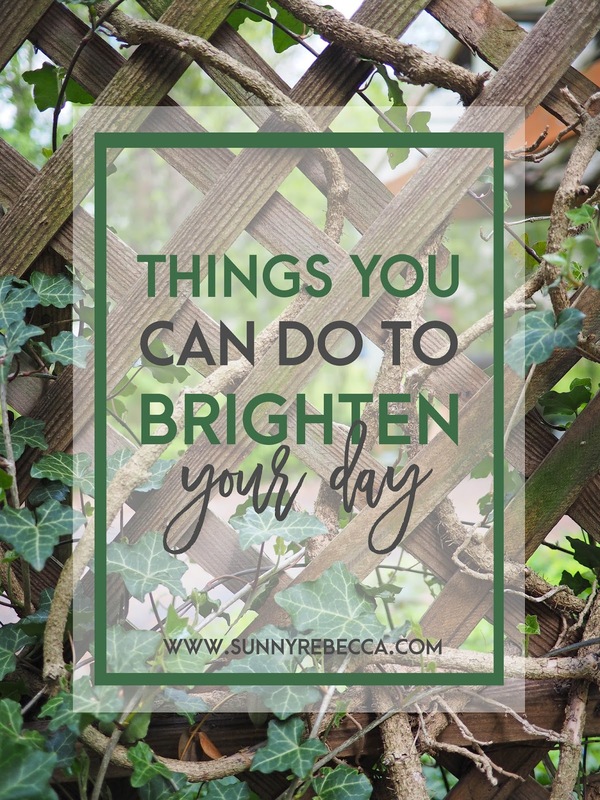 This is especially effective for brightening your day when you're productive in the morning, because after that, your day can be an adventure, you can do whatever your heart desires! Work on a passion project. Like I mentioned previously with putting things off, I often put off passion projects. I get so caught up in things that I have to do and should do that I find that I have little free time. And with that free time, I generally spend it slothing around in my bed with Netflix. However, you can dedicate that time to working on a passion project. I've been wanting to paint more prints so that I can put together a gallery wall of my own work in my room (honestly how cool would that be?!) but I just haven't gotten around to it. They don't call it a passion project for nothing, it's something that is what you're passionate about. When you're doing what you love, you're automatically brightening your day. I go on walks all the time, since I have a dog that needs to be walked daily, but most of the time I take my phone with me and try to get through it as soon as possible in order to cram as much as possible into the day. However, there are some days that I go out to walk and I stay off my phone and take my time, which can be so refreshing. I spend so much time indoors that I don't always appreciate nature. The sun can be a huge factor in making you happier, it's scientifically proven!